Cybex has designed an Arc Trainer that is ideally suited to hotels, corporate fitness, and residential housing where the environment is less demanding than a commercial gym. The 425A has the ultimate versatility that the Cybex Arc Trainer is known for in a smaller footprint. Display: Graphic display of profile, distance, calories, calories/hour, METs, watts, strides per minute, heart rate, time, incline and resistance level. Load dependent- The Arc Trainer is load dependent which means that resistance is scaled to the user’s weight. Two exercisers, one who weighs 250 lbs and the other 125 lbs, both get the same workout when they enter the same program levels and their own weight. The perfect workout … and only Cybex has it. Custom Colors- Why stick with silver grey when you choose from any of our five standard colors (white, black, platinum sparkle, metaltone gold, black chrome)? Or … select from over 180 custom colors to match any decor. Only Cybex offers color customization in CV and strength equipment. Compact Footprint- The compact footprint saves space and the elegant design is inviting in any environment. Resistance Type- An exceptionally broad resistance range lets you train as easy as you like or as hard as you need to. 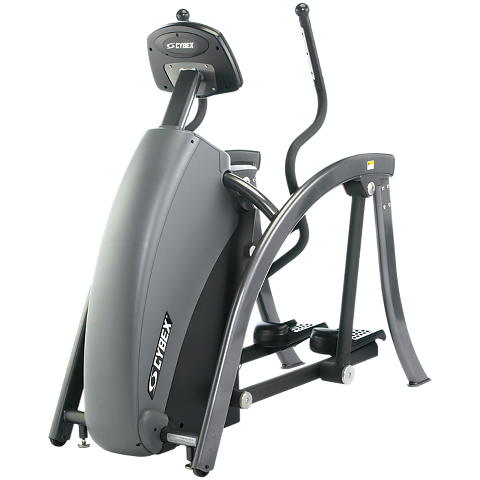 Dietspotlight.com 3.5 out of 5 Cybex 425A Arc Trainer is an industrial arc trainer perfect for small gym settings like hotels and business workout facilities. *Note: Most of the sites, stores or shopping portals listed above sell Cybex 425A Cross Trainer with discounts and other exciting offers. There is a possibility that the some of above websites are not selling Cybex 425A Cross Trainer now. Toughtrain.com is not liable for such cases or instances. Also we do not recommend any seller for Cybex 425A Cross Trainer and a buyer should buy from where he/she gets best deal with quality of products, service and on time delivery (shipment).